You can manage product inventory in Admin, which allows you to associate products with inventory and track the available, on hand, on reserve, and on backorder quantities for your products in Kibo eCommerce. Once you associate products with inventory, you can then control products’ storefront behavior based on whether inventory exists for each individual product. Before you associate your products with inventory in Kibo eCommerce, you must first enable inventory support for one or more of your locations in Kibo eCommerce. Once you enable inventory support for a location, you can then associate your products with inventory records at that specific location. Refer to Associate Products with Inventory for more information about associating products with inventory. Note: You must create your locations in the Locations module before enabling inventory support for locations. Refer to Location Settings for more information about setting up locations. Go to Main > Fulfillment > Locations. (Optional) Decide whether you want to Allow fulfillment without stock on hand. This setting allows you to fulfill orders without sufficient on hand quantities. This is useful if you want to mark items as fulfilled before entering newly arriving stock quantities in Kibo eCommerce. Refer to Fulfill Items Without Sufficient Stock for more information. Refer to Location Settings for more information about the various location settings you can configure. After you create products, you can associate them with inventory at a specific location in Kibo eCommerce. Note: Before associating products with inventory, you must first enable tracking inventory for specific products. Kibo eCommerce opens the product inventory grid and automatically searches for the applicable product. If the product is a configurable product with options, Kibo eCommerce searches on the base product’s code. If you’ve already associated a product with inventory, but you need to adjust the on hand quantity for the product refer to Adjust On Hand Quantities for more information. Located at Main > Catalog > Inventory, this grid shows you the inventory from a product viewpoint. From this grid, you can select a product to view its inventory in all applicable locations. Located at Main > Fulfillment > Inventory, this grid shows you the inventory from a location viewpoint. From this grid, you can select an applicable location to view all product inventory at that specific location. Available The total quantity that's available to sell. Kibo eCommerce calculates this quantity using the following equation: on hand - on reserve = available. On Reserve The quantity that shoppers have purchased and has not been fulfilled. Kibo eCommerce calculates this quantity using the following equation: purchased and unfulfilled products = on reserve. On Hand The quantity that you have in stock in your warehouse. You can manually adjust this value. Refer to Adjust On Hand Quantities for more information. Note: On hand is the only inventory quantity type that you can modify in Kibo eCommerce. On Backorder The quantity that shoppers have purchased and are backordered. A product becomes backordered when you do not have sufficient available quantities for the order, but shoppers have still purchased the product. Note: To allow shoppers to purchase a product without sufficient available quantities, you must first enable backordering for the specific product. Refer to Out of Stock Behavior for more information. This mode is useful if you’re entering newly received stock into Kibo eCommerce, because you can adjust the on hand quantity by the amount you just received, instead of having to account for your existing on hand quantity and manually add your new stock to this quantity. Set — This mode allows you to set a new on hand quantity, regardless of the previous quantity. This mode is useful if you’re performing an inventory audit and you need to set the actual on hand quantity to a new amount, instead of having to account for the previous on hand value and manually add or subtract any differences. By default, Kibo eCommerce prevents you from fulfilling items without sufficient on hand quantities. However, you can override this default behavior for a specific location, which allows you to fulfill items even without sufficient on hand quantities. For example, you do not currently have a sufficient on hand quantity to fulfill an item in Kibo eCommerce, but you know that the warehouse has received new stock but hasn’t had time to enter the amounts in Kibo eCommerce. By allowing fulfillment without sufficient on hand quantities, you can still mark an item as fulfilled and Kibo eCommerce will automatically adjust your on hand quantity accordingly. The warehouse can then add the new on hand quantities in Kibo eCommerce. Note: In order to enable Allow fulfillment without stock on hand, you must first enable Location supports inventory. Refer to Returns for more information about returns. When a product goes out of stock, you can select various out of stock behaviors for Kibo eCommerce to perform. Because Kibo eCommerce allows you to have different out of stock behaviors for each product, you must select this behavior on a per product basis. If you do not specify an out of stock behavior, Kibo eCommerce defaults this setting to Show out of stock message. Show out of stock message Kibo eCommerce displays the product on all applicable storefront pages, including the PDP, categories, and search results. However, shoppers cannot purchase the product and when they navigate to the PDP, Kibo eCommerce displays an out of stock message. To customize the appearance and text of the out of stock message, ask your theme developer to customize your theme labels file. Allow backordering Kibo eCommerce displays the product on all applicable storefront pages, including PDPs, categories, and search results. Shoppers can also purchase the product, and when they do, Kibo eCommerce adjusts stock quantities appropriately. Hide Product in Store Kibo eCommerce hides the product on all storefront pages, including navigation, facets, category pages and search results. For SEO purposes, if shoppers visit the product display page (PDP) using a direct link/URL, Kibo eCommerce displays an out of stock message and the product is not purchasable. Because they are composed differently than standard products and configurable products with options, it is important to keep the following details in mind when dealing with product bundles and product extras inventory. Bundles are products that are intended to group other products (bundle components) together. You cannot not track inventory on the bundle product itself, and instead you must track inventory on each separate bundle component. Kibo eCommerce automatically calculates whether or not a bundle is in stock and purchasable depending on the stock level and out of stock options for each bundle component. Refer to Product Types for more information about bundles. Kibo eCommerce uses the component that has the least amount of available quantity to determine the total available quantity of the bundle. Using the above example, the available quantity of the Action Bundle is three, because there’s only three available quantities of the Action Jacket. Note: You can create a bundle that is composed of more than one of each bundle component, for example 2 Disposable Gloves, 2 Work Gloves, but only one nitrile gloves. As you set the required quantity for each bundle component, keep in mind the interaction this has with your available inventory. If a bundle component has an out of stock behavior of Hide Product in Store, but the bundle itself has an out of stock behavior of Show out of stock message, Kibo eCommerce will still display the component as part of the bundle, but shoppers cannot purchase the bundle. You can select the following If out of stock… behaviors for bundles: Show out of stock message, and Hide Product in Store. You cannot select Allow backordering because this is controlled at the component level. Extras are product attributes that you can offer in addition to the product. You can create an extra that is another product in your catalog, making it a product extra. When you track inventory on product and then assign the product as an extra, the product’s inventory quantities will still be affected when shoppers purchase the product as an extra. Refer to Product Attributes for more information about product extras. 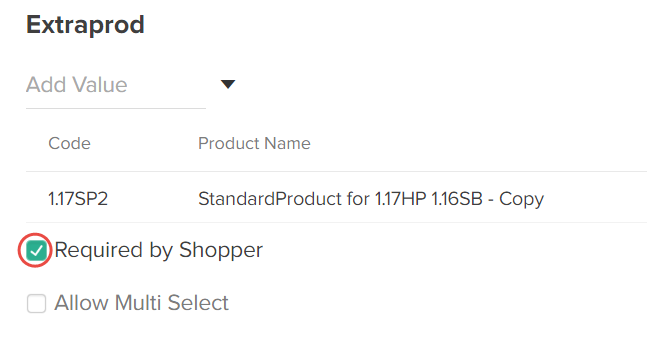 If you enable this setting, and the extra is out of stock, Kibo eCommerce displays an out of stock message on the base product’s display page in the storefront and shoppers cannot purchase the base product. The following example shows a situation in which you want to track negative inventory quantities in order to keep your inventory totals accurate at the end of each day after counting and entering incoming stock. Because you know that you’re going to receive new stock, you also want to allow shoppers to backorder items, and you also want to mark items as fulfilled as necessary. In the following example, you’ve already enabled Allow fulfillment without stock on hand for the location, and you’ve enabled Allow backordering for a specific product. The -2 on hand quantity is essentially your fulfillment debt. Your fulfillment debt is subtracted from the on hand quantity, and Kibo eCommerce calculates the available quantity. The on backorder quantity also returns to zero, because you now have enough on hand quantity to fulfill the remaining on reserve quantity.